External antiparasitic of last generation and broad spectrum for the control and prevention of fleas, ticks and flies and mosquitoes in the dog. It is an antiparasitic monthly application that manages to protect your pet for parasites and sucking insects blood efficiently throughout the year. It is very comfortable and easy to apply, thanks to its system in spot-on. Manufactured by Bayer laboratory, veterinary section. 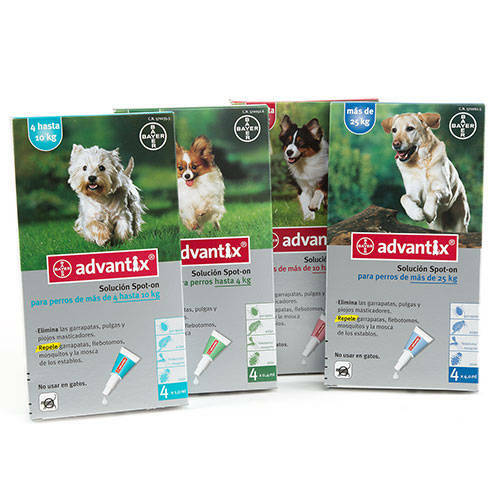 ADVANTIX is effective against ticks (Rhipycephalus sanguineus, Ixodes ricinus, Ixodes scapularis), flea (Ctenocephalides canis, Ctenocephalides felis and Pulex irritans) and mosquitoes as Culex pipiens, Culex modestus, Aedes caspius, Anopheles maculipennis and phlebotomus spp..
Ticks: it removes and repels, preventing anaemia and the transmission of diseases such as Babesiosis, erhlichiosis, etc. effective during 3-4 weeks. Mosquitos and flies: has effect on flying insects repellent (Culex, Flebotomo, etc), prevents the transmission of diseases such as leishmaniasis. Effective during 2-4 weeks. ADVANTIX thanks to the synergy of its components, acts on the CNS of parasites causing a glut of nerve stimuli causing paralysis and death. This effect is enhanced so it is more powerful and faster than if they act the ingredients separately. The solution is distributed throughout the body of the animal, aided by the movement of the body but is not absorbed by the blood stream so it does not damage the internal organs. To stay in the skin of the animal kills fleas by direct contact, these do not sting avoiding discomfort to your pet. Composition: Imidacloprid 10%, 40% permethrin. Instructions for use: Remove the hairs in the interescapular area with your fingers and apply the entire contents of a pipette on the skin. Big Dogs must apply the product at different points to the length of the back of the animal. This product is absorbed in a couple of hours so there is no residue and can caress the dog without danger to persons. Implement a pipette per month. Precautions: this product is designed for use in dogs, do not use on cats. The product may lose effectiveness if it gets wet. Do not apply in puppies less than 2 months of age. It can be used in pregnant and lactating females. Available in 4 presentations. (Each package includes 4 pipettes pods). ADVANTIX 1: dog with a weight of less than 4 kg. It contains 4 pipettes 0.4 ml each. 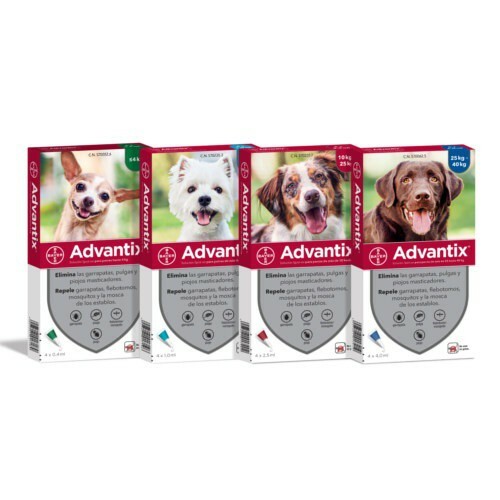 ADVANTIX 2: For dogs with a weight between 4 and 10 kg. It contains 4 pipette 1 ml each. 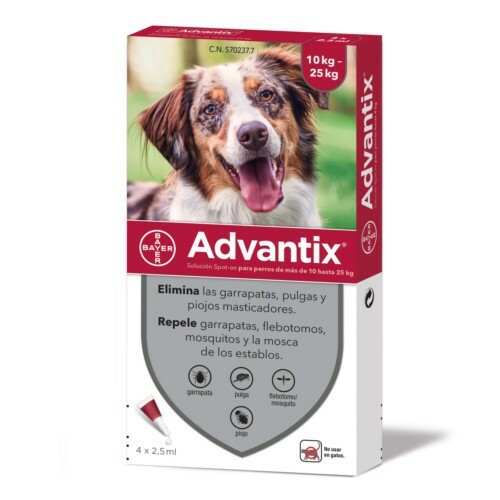 ADVANTIX 3: Dog weighing between 10 and 25 kg. It contains 4 pipettes 2.5 ml each. 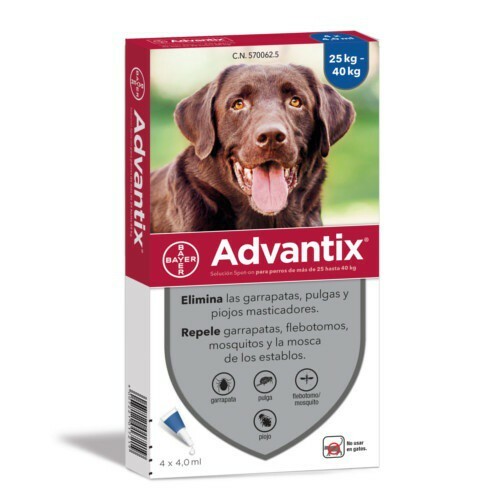 ADVANTIX 4: Dog weighing more than 25 kg. It contains 4 pipettes 4 ml each. Use of this product must be supervised by a veterinarian. We advise that you consult with your regular veterinarian or us questions through the "veterinary consultations" section. 1 customers have reviewed this product. Muy buen producto, nunca le he visto ninguna garrapata ni pulga ni nada. Estoy contenta! !